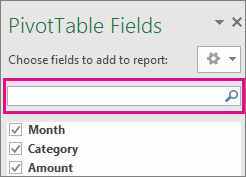 You can quickly find the fields you are looking for in long lists of fields without scrolling, using the new search in PivotTable functionality. Click on the PivotTable with the fields you want to search for. 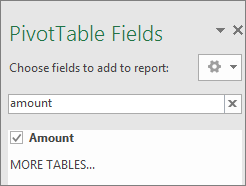 In the PivotTable Fields pane, enter the field name to find. The field you're searching for will now display at the top of the list.